The Island Camp resort, founded from an archeological dig site of the famous Leakey family, is the second oldest tented camp in Kenya (Governor�s Camp being the oldest) and is situated on the southern end of Ol Kokwe Island. 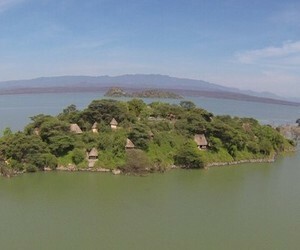 This famous island is in the middle of Lake Baringo, which is one of the major lakes in the Great Rift Valley of Kenya. The camp was further developed by Jonathan Leakey, Alan Douglas-Dufresne and Willie Roberts in 1972. In 1994, the Lonrho Hotel group assisted the Island Group Ranch in obtaining the land title to the property and they further developed the hotel. When this group gave up its hotel business in Kenya in 1996, Mr. Perrie Hennessy took over ownership and management the camp. In 2012 he was joined by Mr. Michael Beamish and Dr. Bonnie Dunbar (owner and developer of the Karen Blixen Coffee Garden & Cottages in Karen, Nairobi) and this group completely renovated the camp in 2013, including construction of new large lake view thatched cottages with verandahs with private pools. Because of its long history, the camp has been the location for holidays for many local Kenyans (who learned to swim, water ski and fish in the lake) as well as an escape for many international tourists and celebrities.